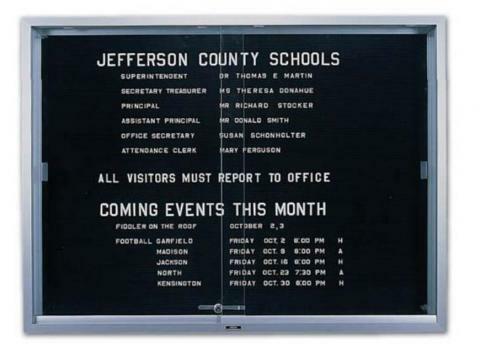 Proudly promote your school's special events with the Glass Message board!Our space saving design makes the Glass Message Board the perfect way to promote school functions within confined sections of hallways. However, you probably will need two people to move the heavy board. Highly-durable satin-anodized aluminum constitutes the frame that surrounds unbreakable tempered safety glass. We fit the sliding glass doors with concealed roller to ensure a quiet and smooth operation. The doors contain finger pulls, making it easy to slide open the glass message board to add new information. Our tamper proof lock thwarts the jokesters at your school from trying to change words inside the 2-inch deep posting area. 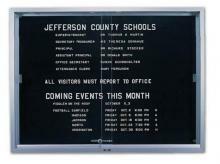 We make the Glass Message Board in five sizes to meet your posting needs.